This photo pretty much says it all. I know the northeast has had it MUCH worse than us but I live in Kentucky and none of my neighbors even own a snow shovel, yet alone know how to use one. I was supposed to go up to Ohio for the photo shoot but that wasn't even a possibility. So I spent the week shoveling snow with a house guest (she lives in the country and would have been really snowed in). They are calling for more snow (and possibly ice) this weekend. I did get a few lessons to review before the snow fell but we didn't get mail for a couple of days so there swatches didn't get out until Wednesday. Again, it is a really good idea to photograph your swatches, front and back, before you send them. Maris had another suggestion which I really appreciate. I've got a few other suggestions I will be doing in upcoming weeks. Maris is working on a vest which has different stitch patterns on the front and the back. She wanted to know how to seam the shoulders (a horizontal edge). 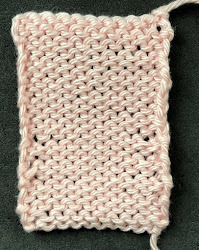 The rule for any horizontal seam is that you use place it in the first stitch below the bind off edge. It is essential that you work in in the center of the stitch, not between the stitches. I have done a blog entry on seaming horizontal edges which you may want to look at if you have not seamed this type of edge before. Here is the link: Previous Blog Post. The difficulty in seaming two different stitch patterns is when you can't read your work. If you are seaming stockinette, the stitch looks like a "V" so you want to seam in the center of the "V". If you are seaming reverse stockinette or garter, the center of the stitch looks like a frown. If you place the seam in the smiles it won't look right. (If this is new information for you, here is a link to a previous blog entry: Previous Blog Entry. What complicates this issue is that when you turn a piece of knitting upside down the "Vs" and frowns are upside down as well. I try and seam with the pieces positioned side by side instead of top to bottom. It is easier for me to see the stitches. I did several photographs. This one shows a reverse stockinette piece seamed to a stockinette piece. It is in progress. Look closely and you can see that the seam is placed in the center of the stitches on both sides. Here it is with the seaming thread pulled tight. This photograph shows two pieces of reverse stockinette. Here is the finished product. Notice how the stitches line up perfectly over the seam. I won't be having salon this week. We are expecting another snow storm. There is absolutely no where to park as it is and it will be worse this weekend! I'm plugging along with my sweater but cabin fever set in and the thought of finishing the second sleeve sent me around the bend. I did sew on the buttons. I found out a friend who I normally knit socks for on her birthday wants fingerless mitts so I am taking a break from the sweater to make them. Wow, you have more snow than we do!! Thanks for the horizontal seams!